Gauhati University (GU) was once synonymous with Krishnachura trees. 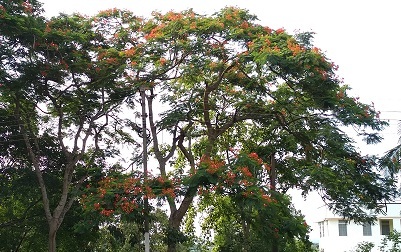 As one enters the GU campus, one can see rows of Krishnachura, also known as Flame trees, lined up. But, this was the scenario till 10 years back. Over the last few years, these Flame trees are fast on the decline in the varsity campus. Currently, there are hardly more than 50 trees left in the campus. She further added that the Krishnachura tree, whose botanical name is Delonix regia, is a species of flowering plant in the bean family and is noted for its fern-like leaves and flamboyant display of flowers. “It is very much fragile and cannot withstand storm or fungal attack. During the monsoons, a certain kind of fungus attacks the root of the Krishnachura tree following which the tree can no longer support its own weight and gets uprooted when heavy winds blow or there is a huge storm,” stated the Professor. She, however, painted a positive picture by saying that recently the Botany Department had carried out plantation drives in the university campus as part of which saplings of Flame trees were planted along with saplings of different species of trees. “In the next five to 10 years, one will get to see an abundance of Krishnachura trees in the GU campus once again,” she summed up.